Our smoke-free environment combines with our 200-gallon saltwater aquarium at Creve Coeur and 400 gallons at Edwardsville, with live coral reef, live music, and bistro-style setting to bring the atmosphere of Bourbon Street, N’awlins to Creve Coeur, Missouri and Edwardsville, Illinois. Welcome, Home Cajun Food Lovers. The food was excellent except the twice baked cheesy potato. For an up charge of over three dollars I expected more than a frozen potato that I could buy a box of at my grocery store for less than the up charge....however, the Cajun food they are known for was excellent. I highly recommend the flavorful chicken gumbo. I also had the bbq shrimp and was pleasantly surprised to find about twenty perfect sized (jumbo) shrimp. For the price, the amount given was great as some places over charge and you get just a few shrimp over a lot of rice...not so here! Both shrimp and rice were flavorful and delicious. However the rice a bit too spicy for my taste but my mother liked it quite a bit. I highly recommend this place if you are looking for a nice Cajun meal. Just be aware that cheap eats it is not the average plate starts at 18 and goes up from there but the authenticity of the dishes and as I noted amount given eases the sting of what you pay. We went on a Sunday afternoon. About a 15 minutes wait which was well worth it. What I liked about it is that as soon as we were seated, the owner thanked us for waiting. The service was great, didn't take long at all for our food to come out either. Sometimes when the food comes too quick it's suspect lol but not here. The food was hot, fresh, and cooked to perfection. I had the Admiral's Feast, my girl had the crab cakes and shrimp combo. She also had the lobster bisque which was excellent. The only reason I didn't give it five stars is because the waitress we had was messing with her hair a little too much for us. We saw her put her hair into a ponytail out on the floor in front of where they pick up the food. That's unsanitary. Don't let that stop you from going because I'm sure by the time you read this post the owner will have addressed that.It won't stop us from going back! My aunt recommended this spot to me. The food was great. Only recommendation i have is to serve the twice baked potato hot. It was luke warm and not so tasty while cool. All was great and service was fantastic. Will be returning to try the more of the menu. Great seafood eating. Food was hot and fresh. Good service good portions. Once again my belly was full. GREAT family atmosphere. The food was good, but the service was only average. There was live music on a week night but it wasn't overwhelming. My wife got crab legs and I went for the crab cakes and shrimp. With the sides it was more than enough food for a big eater. Fantastic NOLA cuisine with extremely fast service. I would recommend the shrimp Po-boy, they provide you with enough food to be full and take home left overs. 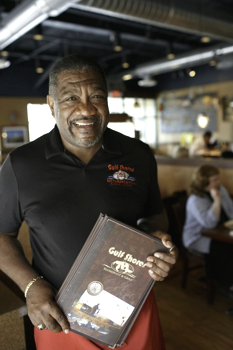 The waiters take on the southern hospitality feel and make the experience that much better. the look, atmosphere, and food sets itself apart from other business attempting to offer the same experience. Excellent food and service! My only complaint is the mixed drink was not up to par. Food is amazing though. Well seasoned and nice selection. Atmosphere is cool and cozy enough. First time here, had heard good things about the place. Three different meals and everyone very happy. Had just returned from the Gulf Coast and as good as anything we had there. Would definitely recommend for seafood lovers. I wish I had taken a picture of the food....Omg, Yummy! !If you want really good seafood and great service, this is the place to go. I brought my leftovers home, heated them up in the oven and enjoyed it all over again.The place was crowned and tight so if you are the kind of person who has a problem with tight spaces and close seating......I suggest you ask for a booth!! I LOVE this place! Some of the best louisiana-style Southern cooking dishes I've ever tasted. The owner prepares many of the dishes from scratch, himself. Daily homemade specials. A must-try restaurant! First time my 4 yr old son has ever leaned back and said "Ahhhh... That was good". Such a proud moment! Everything was amazing. Service was great. The owner seated us. I could tell that they really cared that everything was good. Couldn't ask for more. I'll DEFINITELY be back. The food here is always amazing. They know how to do seafood right and they have a selection you won't find at many places in the area.There are specials every day and live music several times a week. This is a hidden gem in the area, in a strip mall that would make to think it's nothing special. You'd be wrong because this is a must stop for seafood lovers. I'm sure the rest of the menu is good too but I've never gotten beyond the awesome seafood. I was pretty hungry when I arrived for my first visit. Ordered the Jambalaya with battered okra and coleslaw. It came with cornbread. The battered okra was out of this world delicious! The Jambalaya was good but I wish it had a little more rice. Whole meal was very good. Good atmosphere. Will definitely go back. Service was great as well as the food was. Very relaxing atmosphere. Crab legs were awesome as was the crab stuffed haddock and the appetizers! Gator bites were pretty salty though. Pretty awesome food. Everyone in my party enjoyed virtually everything, including me enjoying my second choice--chicken tenders with buffalo sauce. Great New England clam chowder also. They didn't have the Muffuletta sandwich, my first choice, when we arrived, after lunch. Hope to visit again! We love this Restaurant! One of our favorites in St. Louis. Have been going there since it opened. GREAT food and GREAT service ALWAYS! The one man band is wonderful! He always plays the BEST songs. Great atmosphere too! And to die for desserts! You feel like you are in New Orleans! It's not a pretty place to eat, but the food is amazing and our server was on the ball even though she was at the end of a double.I had the Malibu Shrimp. It's golden, crispy , and comes with a pineapple dipping sauce. The Hush Puppies were also quite good and there was a delightful corn muffin. I didn't care for the garlic potatoes. The servings are HUGE. I didn't eat more than half my dinner so I would have room for dessert, but dessert was huge too - even though I split it with my husband!There was quite a wait at 7:00 on a Thursday night, so I recommend getting there before you're really hungry. Went on a double date with some friends. Food was amazing as was the service. Only waited about 10 minutes for a table and stayed for over 2 hours enjoying good food and good company. I definitely recommend and would suggest trying something out of your comfort zone. Will be coming back for sure. Went in... IMMEDIATE smiles and greetings at the door. Customer service was on point... The toasted ravs... SICKENING! they were probably the best I've ever had... The crab cakes.. Phenomenal! Definitely a place earned on my repeat spots to go. You guys won me over! Who would have thought I would not have to go to Louisiana to get excellent Cajun food. The food is wonderful. The service on a scale of 1 to 10 .......... I give them a 212. The owner gets around and provides great service just like the waitresses. He explained to us some of the ways he prepares the meals. The wait staff are the best. Even the hostess is incredible. If you live anywhere on earth and haven't dined here, make certain you put Gulf Shores Restaurant and Grill on your bucket list! The food was very good, atmosphere and music were great. Service was a little slow at the beginning but got better. The only low point was the dessert. I had the chocolate pecan pie and it just wasn't as good as the rest of the meal, would not order dessert here again. Great atmosphere! Food and service is good. Usually a short wait, but the wait is worth it. Casual or your Sunday best, you will always fit in. Excellent customer service. The food is delicious and just dog gone good!!! You should visit as soon as possible. I am sure you will love this place.❤️???? Very good food! I got the crab stuffed haddock. A+. For the table, we got the calamari, also A+. The sauce that came with the calamari and the hot sauces on the table are amazing! This was a very tasty meal and a good size portion. That was my first time there but not my last. I heard the gumbo is one of the best from the person that went with me. We tried the restaurant at the suggestion of a nurse at BJH, Rhonda. Loved it! The food was hot and delicious and the customer service was outstanding, thank you Nick (not Tim)! That's an inside joke. Seasoned just right and we will be back. Owner even stopped by the table to chat. Would've given 5 stars but wasn't crazy about the desserts, peach cobbler and key lime pie. We're still coming back! Excellent food and amazing service. Leslie is the perfect server. The crab and shrimp combo platter was incredible. There was great live music, too, which I wasn't expecting on a Tuesday night! Loved it! We came from out of town and the owner came and introduced himself. Service was excellent and the food was delicious!! Worth the trip! My two grandchildren, seven and three, tore into the seasoned potatoes and corn! Then they helped finish the shrimp and crabs!! Marcus pet yourself on the back! Your staff are the best!! Gulf Shores is a small but vibrant restaurant. The place is crowded with tables and a bar but there's Nawlins decor throughout. We came for the fish and weren't disappointed. There was a variety of fried "fish and chips" fishes (cod is merely one of the options). There were several original sauces and rubs on the table. The hush puppies were small and not very corny so I wouldn't order them again. This restaurant deserves more than 5 stars. My friends and I had dinner here to celebrate one of them getting a new job.I've eaten here multiple times and bragged about how good the service and food was. Let's just say all 8 of the ladies were pleased with their food as well as our server Jake. Gulf Shores Restaurant in Creve Coeur may offer the best true Cajun dining in the St. Louis area. It's nearly impossible to pick a favorite from their diverse menu but the Lobster Pasta Alfredo and the Lobster Ravioli are both magnificent. One could eat at Gulf Shores every night for a month and not have the same item twice! Great service. Live music is often on tap. Full bar on the premises. Easy access off Olive Boulevard. Warning: place gets busy during peak hours. Receive monthly discounts and special in your inbox.